Valiant is proud to debut October’s Character Design Covers by visionary artists David Aja (Hawkeye, Immortal Iron Fist) and Jelena Kevic-Djurdjevic (Web of Spider-Man)! Aja redesigned many of the characters for the publisher’s “Summer of Valiant” launch, including Archer & Armstrong, Bloodshot, and Harbinger’s own Peter Stanchek and Toyo Harada, while Djurdjevic was responsible for the the newly updated X-O Manowar. Now, Valiant is sharing their behind-the-scenes work for the first time in print with an exclusive month of variant covers for all four of its October titles! The Character Design Covers series are available to retailers on an “order all” basis for Archer & Armstrong #3, Bloodshot #4, Harbinger #5, and X-O Manowar #6. Look for them in finer comic stores everywhere this October and contact your local retailer to reserve your copies today! 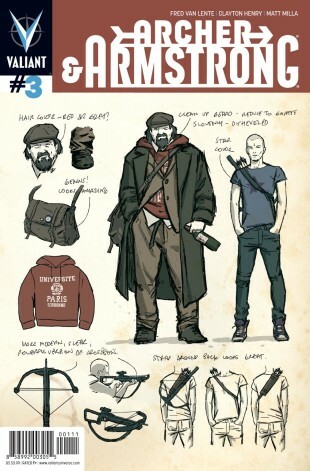 ARCHER & ARMSTRONG #3 – ON SALE OCTOBER 10th! BLOODSHOT #4 – ON SALE OCTOBER 10th! HARBINGER #5 – ON SALE OCTOBER 17th! X-O MANOWAR #6 – ON SALE OCTOBER 17th!